In response to the success of the Road Runner and other low cost alternatives to Pontiac's original musclecar the GTO, the division started work on an alternative low dollar performance car. By the time everyone had their say, the ET (for elapsed time, not extra-terrestrial) had become an option on top of the cost of a GTO. According to legend John Delorean was impressed with the car when he saw it but thought the name ET wasn't catchy enough. Remembering the popularity of the Laugh-In show he suggested The Judge. The prototype was painted Carousel Red, a standard Firebird color. Sharp eyed Chevrolet fans will recognize it as Hugger Orange. It included a stripe based on those that Pontiac performance dealer Royal Bobcat had been putting on their modified cars. The L74 Ram Air motor, Hurst T-handle shifter, blackwall G70 x 14 tires, dechromed' (no trim ring) Rally II wheels, blacked out grill, and decals with The Judge and a gavel completed the conversion. By the time the first 2,000 planned Judges hit the showrooms in 1969 the stripe was modified to a three color slash that continued back to a point under the quarter glass. In addition the decal was changed to a pop art three color The Judge without a gavel, and the spoiler was modified slightly. A The Judge emblem on the glovebox door was supposed to be included, but supply problems prevented the first cars from receiving them. Sometime after the initial run was manufactured Pontiac began offering The Judge in any GTO exterior color, although at least half of the almost 7,000 cars were the trademark Carousel Red. Although some contemporary journalists described The Judge as a failure almost 10% of GTOs made that year were ordered with the package. At under it was a relative bargain considering the cost of ordering the Ram Air motor and Rally II wheels by themselves. It certainly attracted attention for the showroom - who knows how many other Pontiacs were sold to people dropping in to take a look at Pontiac's extrovert! Although The Judge was originally intended as a one year promotion its sales kept it alive for the next two seasons. The 1970 version was basically the same with the exception of a change to two 'eyebrow' stripes per side to accent the new body lines and a spoiler that no longer curved to meet the quarter panels. Orbit Orange (a yellow - go figure) was the signature color for the car. 1971 was the last year for The Judge, the last year for the GTO convertible, and the first year for low compression. The question I get asked most often is "how can you tell if a Judge is a fake?" It's a fairly simple question, but unfortunately the answer is not nearly as simple. Let's get this out of the way first: there is no number on the car that indicates that it is a Judge! I guess even if there was there is enough fraud in the industry to suspect data plates and VIN tags anyway. My best advice is to contact Pontiac Historical Services for a copy of the factory invoice, this will list The Judge as an option. The next point is that so much time has passed since these cars were new that The Judge specific items could've found their way onto a standard GTO, and perhaps more interestingly they were taken off a genuine Judge. Very few cars are wearing the original paint after decades of driving, and it's not unheard of for Judges to be painted and stripes and spoiler left off. Now to take care of some myths. Contrary to popular belief all Judges were not built with a hood tach. As a matter of fact, the package did not even include gauges! My Judge was ordered with the gauge package and in-dash tach, cars equipped with the hood tach have a clock in the dash. A three speed manual transmission was standard with two four speeds and a three speed automatic available. Another thing I hear occasionally is that hidden headlights were part of the option. Once again this is not true, fixed headlights were standard. As The Judge was basically a GTO practically every option offered for the GTO was available. One notable exception is the power antenna. As the mast was mounted on the top of the quarter panel it would interfere with the spoiler when the trunk was open. So what can you look for? First of all every Judge had either a Ram Air or HO motor. By checking the block code on the engine and verifying the VIN on the engine with the car you are at least assured that it is equipped with the correct motor. The trunk lid is another area to check. The spoiler added a fair amount of weight and necessitated heavier springs. If the lid won't stay up on it's own it might not be original. The lids were also punched from the factory for the bolts from the spoiler. Take a look underneath and see if the mount looks "professional". Many of the reproduction spoilers were molded in one piece while the originals were three piece with separate struts. Most 1969 Judges were Carousel Red so look for the paint code 72 on the data plate on these. Hardtops without a vinyl roof will have 72 twice for the upper and lower color. Convertibles and cars with vinyl tops will have a 72 and then the code for the top color. 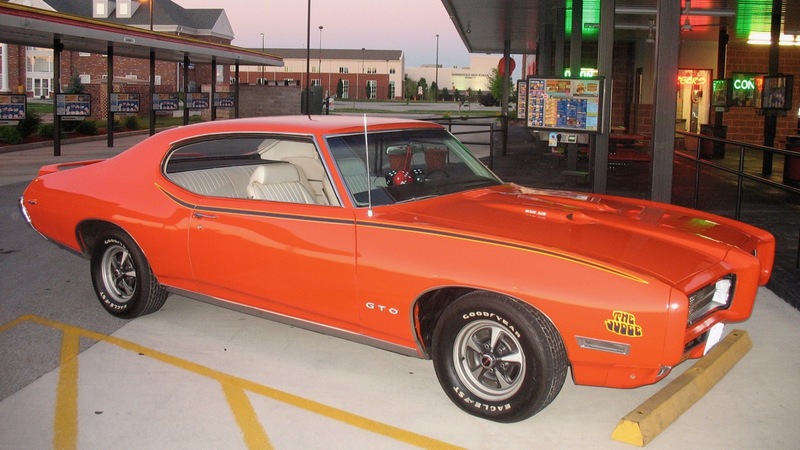 A 72 does not guarantee a Judge as there are several documentes GTOs that were special ordered in Carousel Red. If it is a Ram Air car and it was special ordered with Carousel Red it may be worth almost as much as a Judge anyway. Another tip off is a build date before January of 1969 - there were no Judges built in 1968. All Judges were delivered with either Rally IIs or honeycomb wheels (available in '71). Don't discount a car on this as wheels are obviously easily changed. Also, although the Rally IIs were specified with no trim rings they were often added so the existence of rings or marks where they have been really doesn't mean much one way or the other. The grills on all Judges were supposed to be "blacked out", although there is a period picture that shows a 1969 Judge with the standard solver grills.